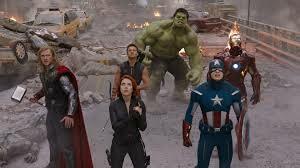 It’s fun to watch all of these super heroes in the same movie, and the storyline is smart enough to constantly be throwing us into new scenarios. The Avengers is good, but not great. It certainly gets all of the action just right, including multiple fight scenes throughout the film and an epic scale climax set as a war on the streets of new york. Aside from all of that there’s a good amount of humor, courtesy of Downey Jr. playing iron man, the role he does so well. there’s a lot that works, but also some things that don’t, such as the sometimes corny dialogue or the fact that the movie spends way too much time on a helicarrier aircraft for its second act. This is definitely a good movie, filled with ideas, but it does sometimes feel a little slow. Still it’s not easy to make a superhero movie, and especially not easy to make one that isn’t dark. this movie hits a few bumps, but it still pulls off the task nicely. 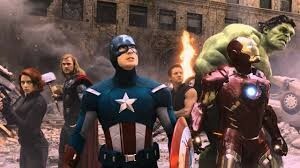 The Avengers is the movie that was years and years in the making. it’s the movie that marvel studios decided it was going to make ages ago, and then started giving us bits of previews about as hidden scenes after every one of their other movies. 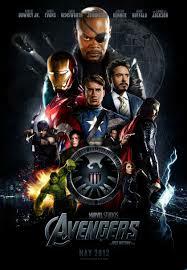 the avengers is the movie that they have been setting up ever since the first iron man movie in 2008. and at last it’s here. the hype has been tremendous. the movie itself is just pretty good. the movie has a hell of a lot to play with here. and it makes most of these elements work. for one thing, it really does feel cool to watch these characters together. we’ve seen them each in their own movies, from iron man, to thor, to captain america. and the avengers has some clever ways of approaching the material. for example, it knows better than to begin with them all together in any way at all. instead, it shows each character in their own worlds and gives us nice long scenes that feel right out of those other movies. so tony stark shares a scene with pepper potts on his rooftop with his robot butler jarvis speaking to them. or thor fights with his brother, loki, while on a mountainside as the two of them talk about their ongoing rivalry. each of these things feels right out of the character’s own movie. so right away, we are placed in a world that we are already familiar with, with the promise of even cooler things up ahead. what that does is it makes us feel like this movie has a little bit of each of the other films in it. whatever we liked about those films (the witty banter in iron man as tony stark mixes it up with pepper, the shakespere-like talk between the two brothers in thor), it’s in this movie too. the avengers has the best of all worlds. that’s the idea, anyway, and it works. the movie seems to be divided up into three sections, and all three of them work in their own way. the first one is the introduction to all of the characters and the bringing of all of them together. director joss whedon does a very nice job of taking his time with the introductions. he brings us one character at a time, and really gives us a scene or two to get to know what is happening with that character. and after each one of these scenes, we are excited because we still know what else is coming that they haven’t shown us yet. so, for example, it takes a while for them to bring thor into the mix, and that’s a good thing, because we wait with eager anticipation for him to arrive. when the characters do all meet up, we get fights. the first fight is between iron man, captain america, and thor and it takes place in the middle of the woods. each character uses his superpowers and for once we are not really sure who to root for. instead of being invested in it, like we are in most superhero films, we just sit back and watch. and it’s a lot of fun. then we get to the second part of the movie, nick fury’s shield station. it seems like a giant ocean liner, but it turns out to be something much more. once on board, all of the avengers finally unite. bruce banner in particular, played by mark ruffalo, is a subject of everyone’s attention. after all, his character has the ability to turn into the hulk, which is nothing short of a giant green monster. in this second act, we get a bunch of other fights between avengers members. there’s also a lot of dialogue here. i love that the entire lengthy second act, on the shield station, goes through different tones. there’s the mystery angle, where three avengers members stand in a room discussing how it seems something isn’t what it seems with what nick fury and shield are up to. then there’s the accusation scene, where everybody turns on each other. and then there are all of the attacks. there’s the hulk fighting thor, hawk-eye fighting black widow, and the hulk chasing after black widow. with all of this in house fighting going on, there’s a totally different problem for iron man and captain america, as they have to not only fix a propeller, but also take on some humans who come at them while under loki’s influence. loki factors into the second act in some major ways as well. writer / director joss whedon knew he was going to set the entirety of his second act on board the ship, and so he knew if he didn’t have loki on this ship, then he would have no villain there at all. and so loki is there. he’s a prisoner. and the cell that he’s imprisoned in is discussed not only in terms of him, but also in terms of both the hulk and thor. what’s especially cool is that even though loki is imprisoned, he still ends being super threatening and even kills a main character. the third and final act involves a giant attack on new york city. now this is where whatever reality the movie had to offer goes out the window, as there is not only a huge hold in the sky, but creatures on flying motorized chariots falling out of it. While it is tremendously fake, it is still kind of cool. we certainly get some fantastic action out of it. and on top of that, there’s a lot of humor involved here, which goes a long way. the avengers is a pretty good movie. Whatever flaws it has are small. The second act, on board the shield ship might take a while, for instance, but that’s okay because there is just so much going on during that act. it’s almost like a movie where the entire thing takes place in one mansion. and that’s just one act. all of the actors here are first rate and they do a great job with their characters. the action is fantastic, and there’s a lot of it, which is exactly what you want in a movie like this. i also love all of the connections to the other films, such as the scientist from thor (stellan skarsgard) being a major part of this film, and us seeing a photograph and hearing about natalie portman’s character, jane from that movie. pepper and jarvis being in the movie for iron man’s storyline is another example. and even the hulk destroying harlem is mentioned. i love the use of manhattan for the third act of the film and the way the movie keeps coming back to stark tower, which is somewhere in between the chrysler building and grand central station. this movie was very well written and keeps moving forward at all times. both the humor and action are top rate and the story moves it all along nicely.